In today’s dynamic workplace environment, expectations change quickly and the agile leader is indispensable to your organization. How do you identify potential leaders and develop them into the star players that will lead your organization in the current business climate? 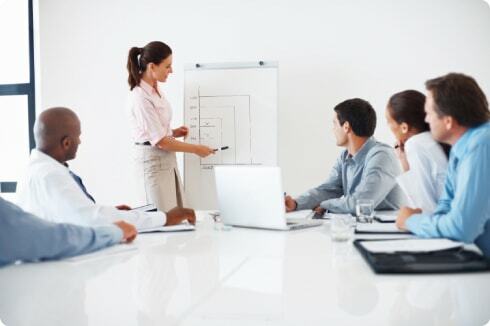 Employee Development Systems, Inc. (EDSI) provides the required tools and programs for identifying and developing emerging leaders and helping experienced leaders become aware of the skill areas that need further development. Strong organizational leadership skills influence the productivity and development of smooth operations for an entire organization. Employee Development Systems, Inc. (EDSI) works with organizations to develop teams, managers, and leaders who can inspire greater performance and accountability, driving success and growth. . Many managers have risen through the ranks of their organization and have not had the opportunity to hone their core organizational leadership skills, such as communicating clearly to set performance expectations, describing behavior through positive feedback reinforcement, acknowledging ideas for continuous improvement, amongst other skills. At EDSI, we have been resolving employee development, leadership, generational, professional presence, and personal effectiveness issues for over 30 years. Contact us to learn how we can help increase productivity and profits in your organization. 800-282-3374.